Showing items in category Transjordan, sorted by newest listed first. TRANSJORDAN - 1956 local cover showing 15m adhesive with OVERPRINT INVERTED. 1956 (APR.24.) 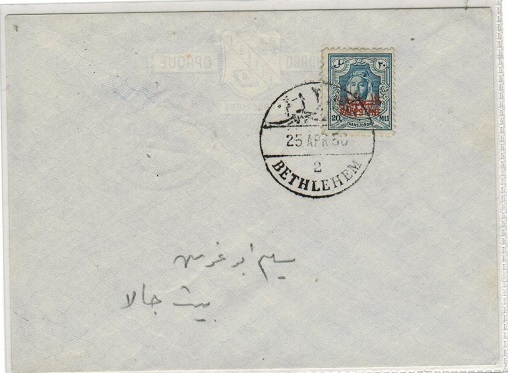 cover addressed in Arabic bearing the 15m olive-green showing the major variety OVERPRINT INVERTED (SG P9a) tied by BETHLEHEM / 2 cds. Used during the Jordanian occupation of Palestine. TRANSJORDAN - 1956 local cover with 5m adhesive showing OVERPRINT INVERTED. 1956 (APR.24.) 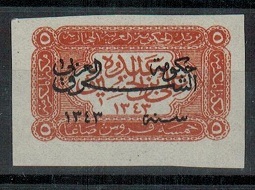 cover addressed in Arabic bearing 15m adhesive tied in combination with the 5m orange showing the major vaiety OVERPRINT INVERTED (SG P6a) and tied by BETHLEHEM / 2 cds. Used during the Jordanian occupation of Palestine. TRANSJORDAN - 1956 local cover with 20m blue showing OVERPRINT DOUBLED. 1956 (APR.25.) 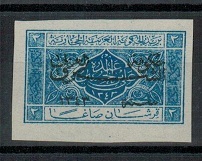 cover addressed in Arabic bearing 20m blue showing the major variety OVERPRINT DOUBLE (SG P10b) tied by BETHLEHEM / 2 cds. Used during the Jordanian occupation of Palestine. TRANSJORDAN - 1954 2 1/2d rate 'Forces' cover to UK used at FPO/575. 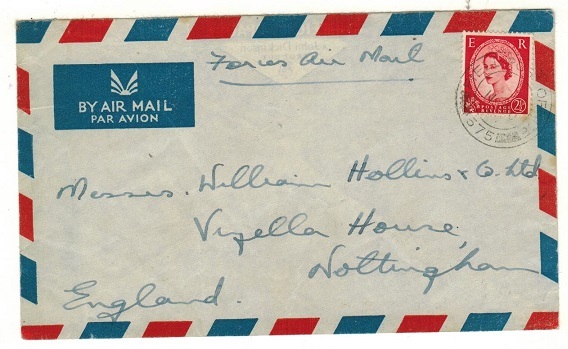 1954 (OC.11) cover to UK marked 'Forces Air Mail' bearing 'GB' QEII 2 1/2d adhesive tied by FIELD POST OFFICE/575 cds. Sent by Major Hunt of the Arab Legion Royal Artillery statined at Amman. TRANSJORDAN - 1957 2 1/2d rate 'Forces' cover used at FPO/149. 1957 (FE.11) air mail envelope addressed to UK marked 'Forces Mail' and bearing GB 'QEII' 2 1/2d adhesive tied by FPO/149 cds. Troops stationed at Amman. TRANSJORDAN - 1937 35m rate registered cover to Syria used at IRBID. 1937 (NO.2.) 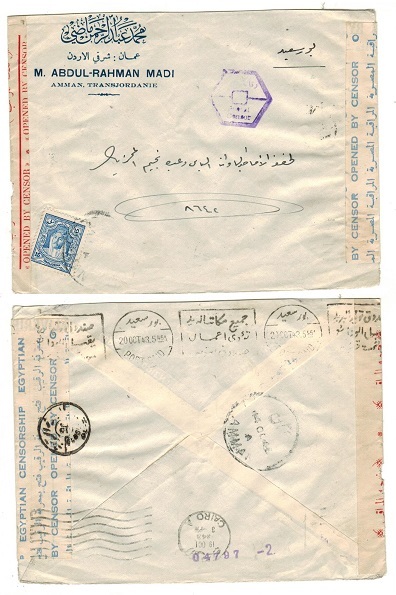 registered cover addressed to Syria in Arabic (ex reverse flap) bearing 15m and 20m adhesives tied IRBID and with scarce blue on white perforated R/IRBID/No. registered label at left. DAMAS arrival b/s. TRANSJORDAN - 1924 1/4p green 'TETE BECHE' pair with INVERTED OVERPRINT unused (no gum). SG 126c. 1924 1/4p green in a unused (no gum) 'TETE BECHE' vertical pair with the major variety ONE WITH OVERPRINT INVERTED. SG 126c. TRANSJORDAN - 1928 'Constitution' series of 11 in fine mint condition. SG 172-82. 1928 'Constitution' series of 11 in fine mint condition. SG 172-82. TRANSJORDAN - 1923 1p dark blue with gold overprint in fine used condition. SG 103b. 1923 1p dark blue adhesive with gold overprint in fine used condition. SG 103b. TRANSJORDAN - 1923 10p ultramarine with gold overprint in fine mint condition. SG 67. 1923 10p ultramarine adhesive with gold overprint in fine mint condition. SG 67. TRANSJORDAN - 1922 2p on 2p olive fine used condition. SG 25. 1922 2p on 2p olive overprinted adhesive in fine used condition. SG 25. TRANSJORDAN - 1924 1/4p green U/M with INVERTED OVERPRINT. SG 126b. 1924 1/4p green adhesive of Saudi Arabia overprinted 'Government Of Arab East' in fine unmounted mint condition and showing the major error OVERPRINT INVERTED. SG 126b. TRANSJORDAN - 1940 15m rate censored commercial cover to Egypt. 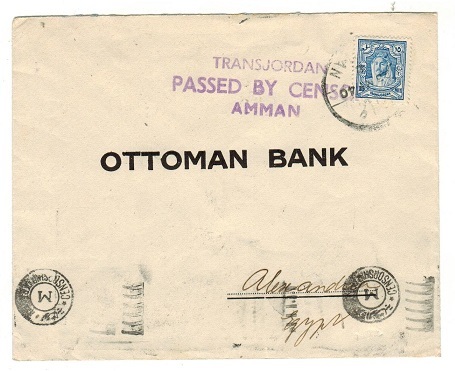 1940 commercial 'Ottoman Bank' cover addressed to Egypt bearing 15m adhesive tied AMMAN and struck by violet three lined TRANSJORDAN/PASSED BY CENSOR/AMMAN handstamp. Little type 1. TRANSJORDAN - 1943 15m censored commercial rate cover to Egypt. 1943 (OC.14.) 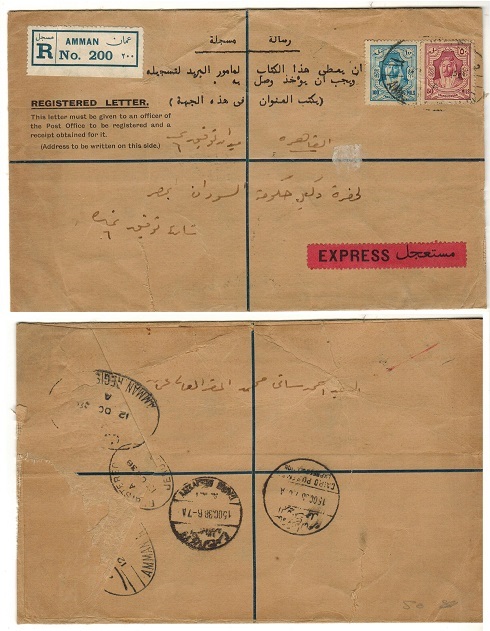 commercial cover addressed to Egypt bearing 15m adhesive tied AMMAN with rare red on cream OPENED BY CENSOR label at left (Little type 4B2) and re-censored on arrival in Egypt. 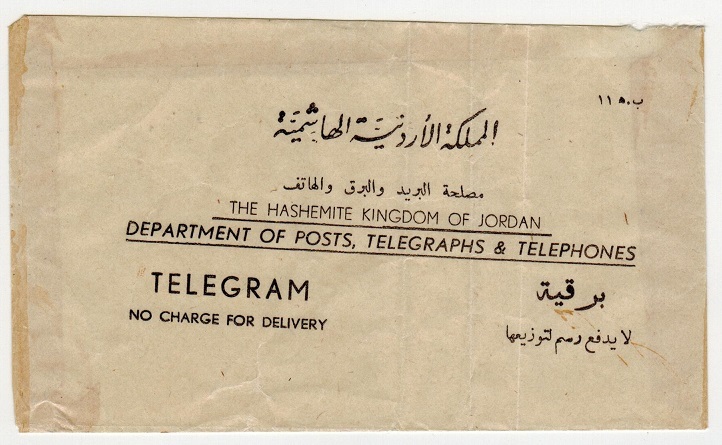 TRANSJORDAN - 1950 (circa) unused Jordanian TELEGRAM envelope. 1950 (circa) unused 'Department Of Posts, Telegraphs & Telephones' TELEGRAM envelope. (3 vertical bends). TRANSJORDAN - 1950 stampless local cover with 'ARMY/JCJC/SIGNALS' cancel. 1950 (8.VII.) 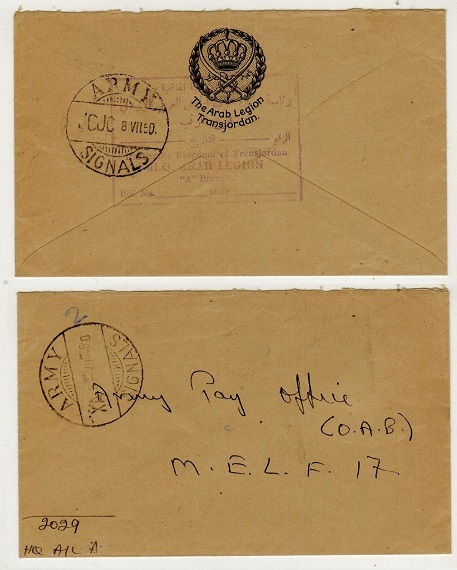 use of small stampless crested 'The Arab legion/Transjordan' envelope addressed to the Army Pay Office at MELF 17 struck on reverse by large violet boxed HASHEMITE KINGDOM OF TRANSJORDAN/H.Q.ARAB LEGION/ 'A' BRANCH h/s and with scarce ARMY SIGNALS/JCJC strike applied with ARMY SIGNALS/ XA receiver on front. 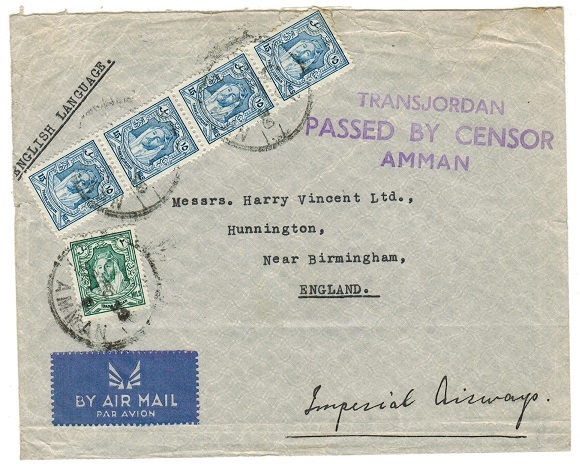 TRANSJORDAN - 1938 10m rate cover to UK used on the AMMAN-DERRA 'TPO'. 1938 (MR.1.) 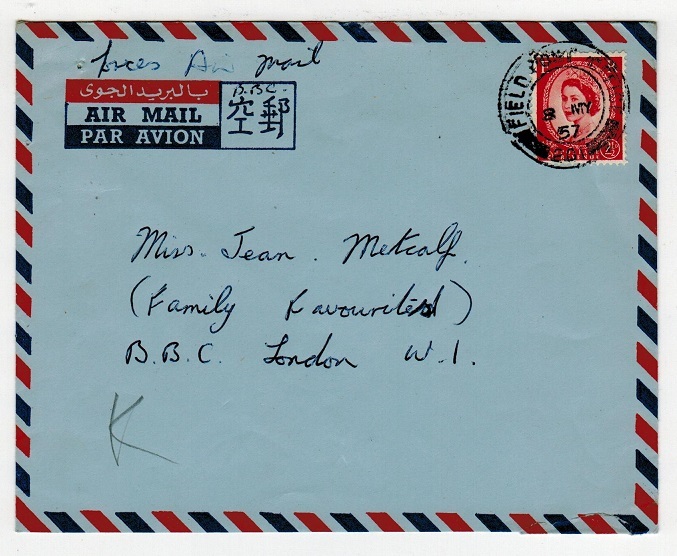 cover addressed to UK with 'Transjordan/Frontier Force' mongram on reverse flap bearing 10m adhesive tied by AMMAN-DERAA 'TPO' cancel. TRANSJORDAN - 1936 25m rate cover to UK used at AMMAN. 1936 (FE.4.) 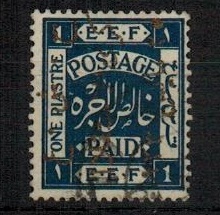 cover addressed to UK (opened on three sides) bearing 10m and 15m adhesives tied AMMAN. TRANSJORDAN - 1937 10m rate cover to UK used at MAAN. 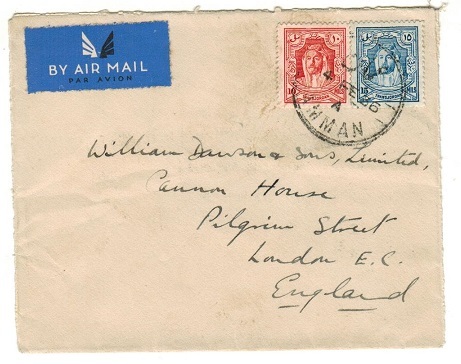 1937 (AP.14) cover to UK (toned left hand corner) bearing 15m adhesive tied by very fine MAAN cds. 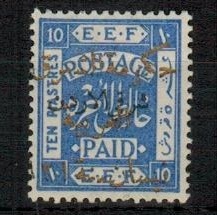 TRANSJORDAN - 1938 'FORMULA' RPSE (faults) with scarce EXPRESS label usage. 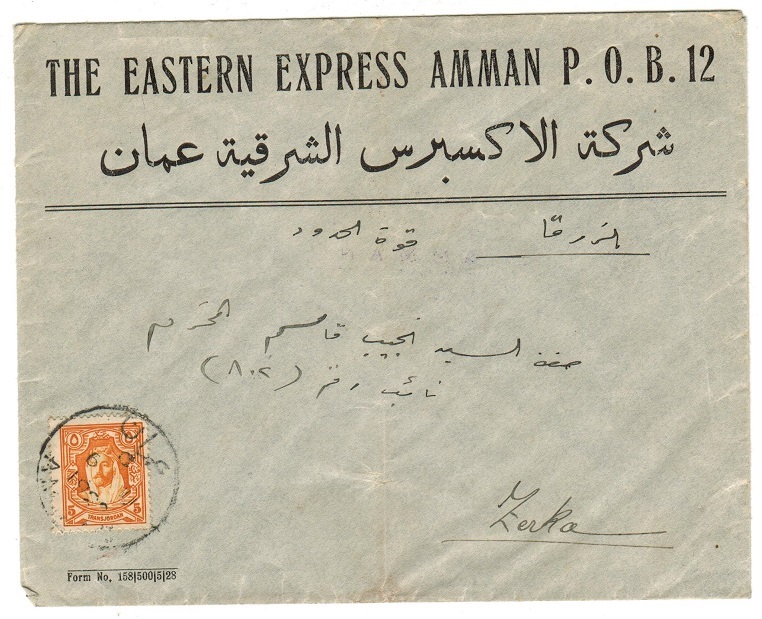 1938 use of black on buff FORMULA registered postal stationery envelope (size H) addressed to Jerusalem in Arabic and bearing 50m and 100m adhesives tied by oval REGISTERED AMMAN cancel. The envelope has a edge tear at bottom left, part of reverse flap missing and some heavy creases but bears a copy of the scarce black on red perforated EXPRESS label. Faults but scarce. TRANSJORDAN - 1940 (circa) FORMULA Air letter unused. 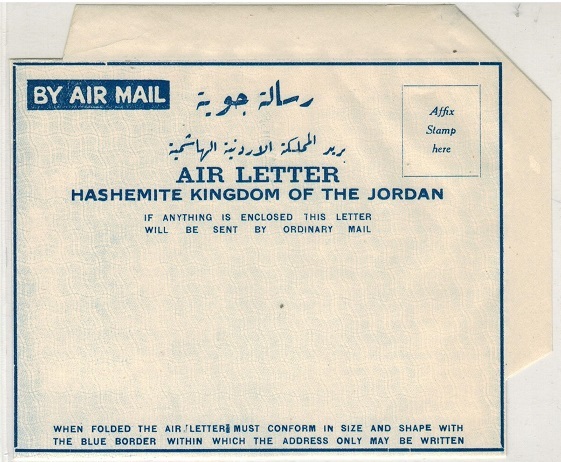 1940 (circa) blue on white FORMULA air letter inscribed 'Air Letter/Hashemite Kingdom of the Jordan' in fine unused condition with 5f & 20f adhesives officially added. Elusive piece of stationery. TRANSJORDAN - 1931 10fils rate postcard use to Switzerland used at AMMAN. 1931 (AP.20.) 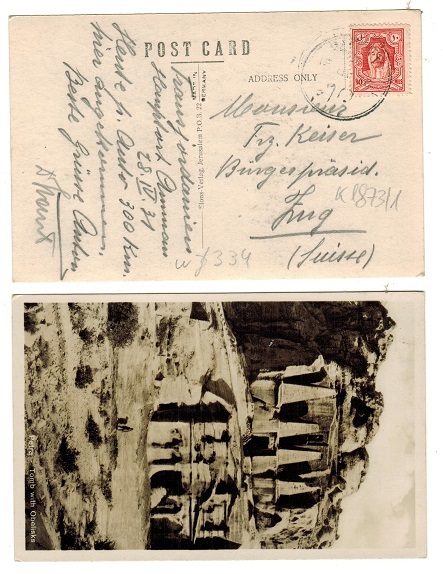 use of picture postcard addressed to Switzerland depicting 'Petra-Tomb with Obalisks' bearing 10m adhesive tied by AMMAN cds. TRANSJORDAN - 1934 10fils rate postcard use to USA used at EL ZARQ. 1934 (JY.17.) 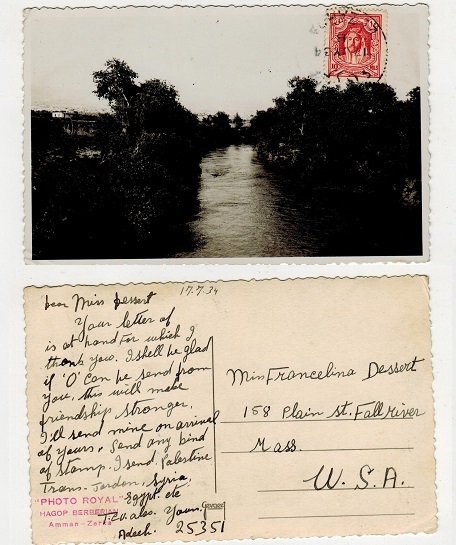 use of picture postcard addressed to USA depicting river scene and marked on reverse 'Photo Royal-Hagop Berberian-Amman-Zerka' bearing 10fils adhesive tied to the picture side by EL ZARQ cds. Genuine use and scarce. 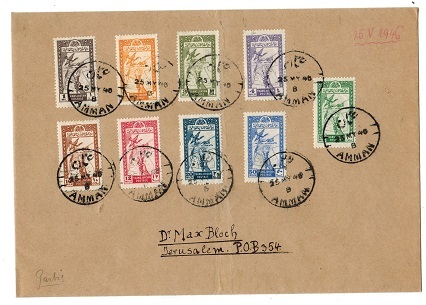 TRANSJORDAN - 1941 multi franked OHMS cover (surface creases) used at MAAN. 1941 (NO.9.) arabic 'OHMS' manila cover addressed to a military location (heavy surface creases) bearing 1mil to 50 mil adhesives tied by three complete MAAN cds's. 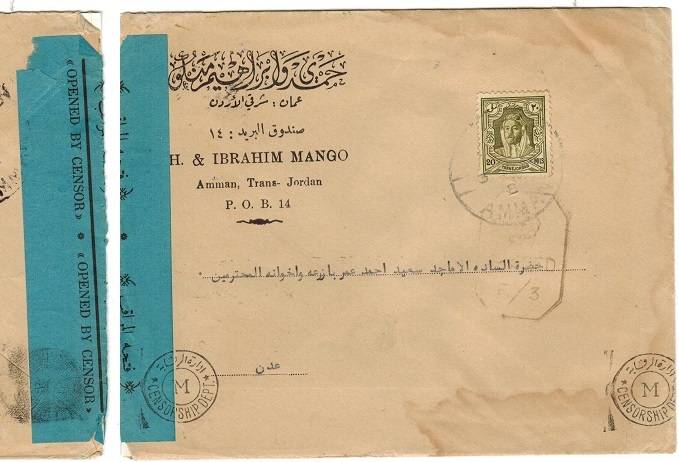 TRANSJORDAN - 1931 15m rate AMMAN-DERNA 'TPO' cover to UK. 1931 (JA.20.) cover addressed to UK (roughly opened reverse flap) bearing 15m adhesive tied by AMMAN-DERNA cds. A nice TPO usage. 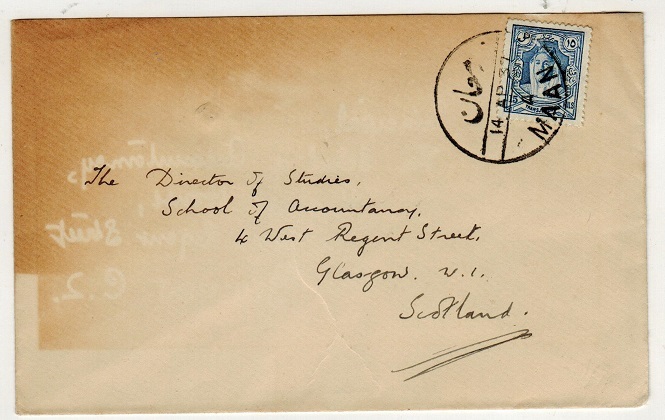 TRANSJORDAN - 1925 registered cover to UK cancelled by rare violet AMMAN negative seal. 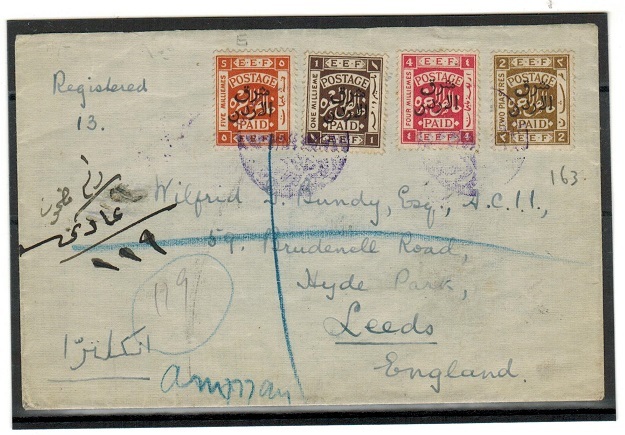 1925 registered cover to UK bearing 'East Of The Jordan' (two lined) 1m,2m,4m and 5m overprints (SG 143,44,46 and 47) tied by late use of the scarce former Arab Kingdom negative seal struck in violet ink inscribed POST & TELEGRAPH OFFICE AMMAN (Proud type D1) with scarce AMMAN b/s (Proud type D8) struck in violet (only in use for 1 year) and with scarce HAIFA-KAHTARA/T.P.O. SOUTH transit b/s dated 1.DEC.25. Very scarce. 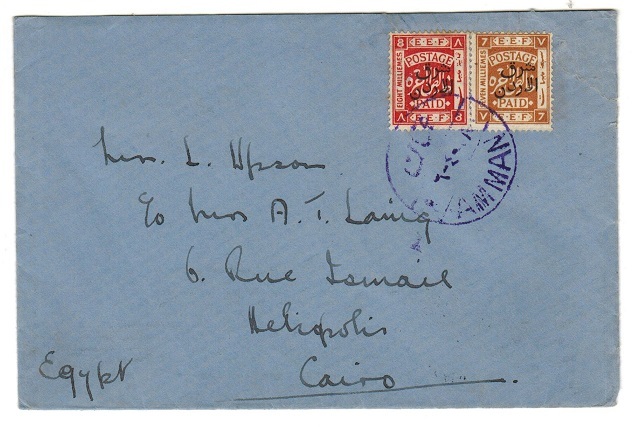 TRANSJORDAN - 1926 cover to Egypt used at AMMAN. 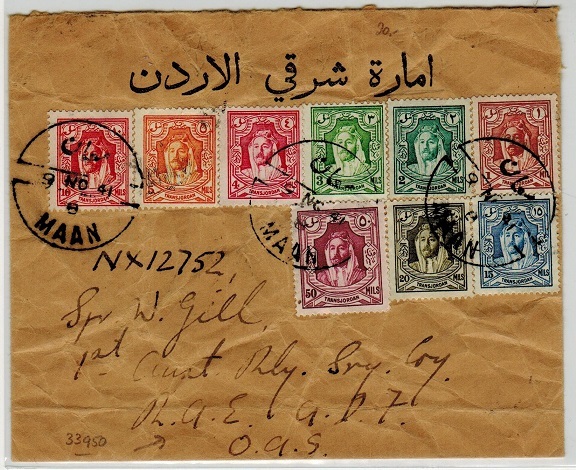 1926 cover to Egypt bearing 7m & 8m adhesives (SG 149+50) tied by bilingual AMMAN cds struck in violet. Haifa transit & Heliopolis arrival b/s. 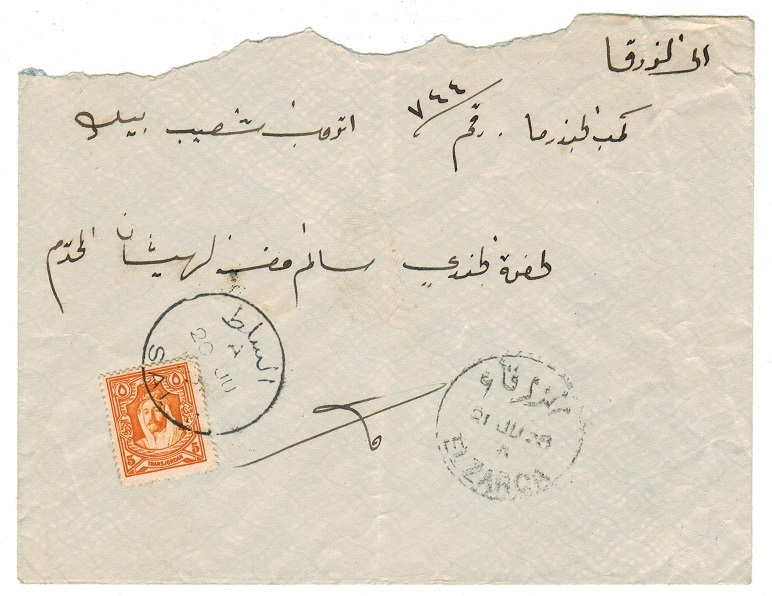 TRANSJORDAN - 1928 cover to UK used at EL ZARQA. 1928 (JY.24.) 'Pegasus' monogram envelope addressed to UK bearing 3m (x5) adhesives tied by EL ZARQA cds (Proud type D2) with HAIFA transit b/s. 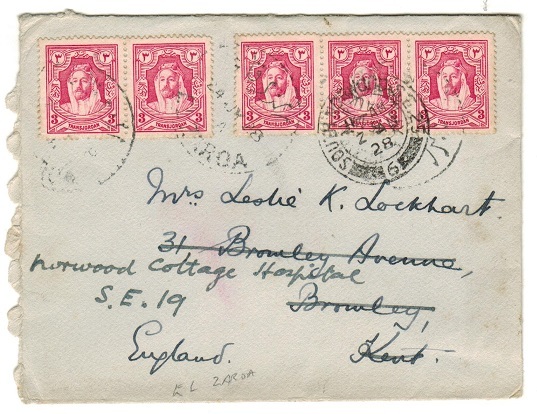 TRANSJORDAN - 1928 cover to UK used at SALT. 1928 (FE.13.) cover addressed to UK bearing 5m orange strip of three tied by SALT cds's. (Proud type D4). TRANSJORDAN - 1936 multi franked cover to UK used at AMMAN. 1936 (JU.25) cover to UK bearing 1m-5m adhesives tied by AMMAN 'bridge' cds's. (Proud type D13). 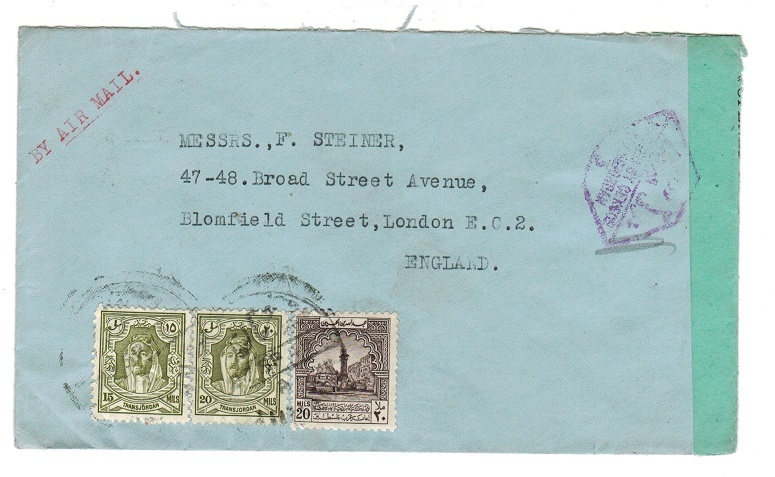 TRANSJORDAN - 1939 censor cover to UK. 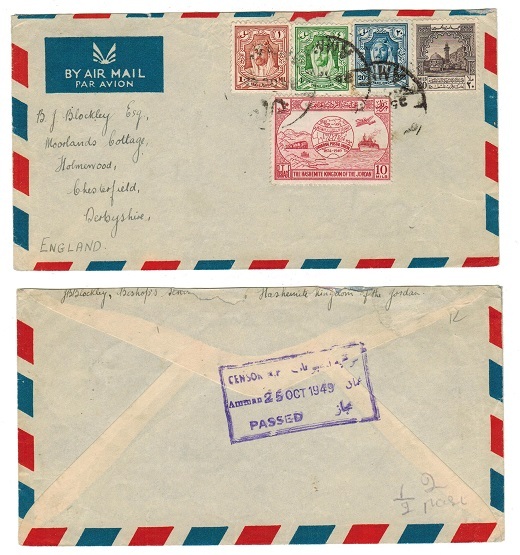 1939 (22.OC) cover to UK bearing 2m & 15m strip of four tied by AMMAN cds's & with violet three lined TRANSJORDAN/PASSED BY CENSOR/AMMAN h/s at right. A nice early use. TRANSJORDAN - 1944 censor cover to Aden. 1944 (SP.3.) 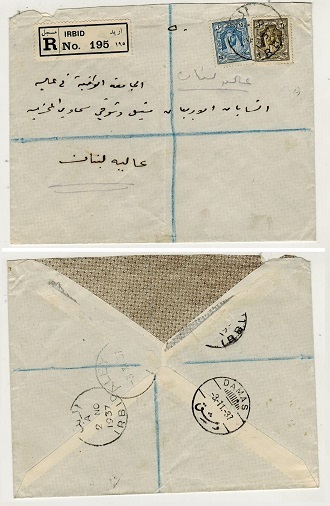 cover addressed to Aden in Arabic bearing 20f adhesives tied AMMAN with scarce black on blue OPENED BY CENSOR strip at left edge (Little type 4B2). TRANSJORDAN - 1935 inward military cover with scarce POSTAGE DUE cachet applied. 1935 (NO.12.) 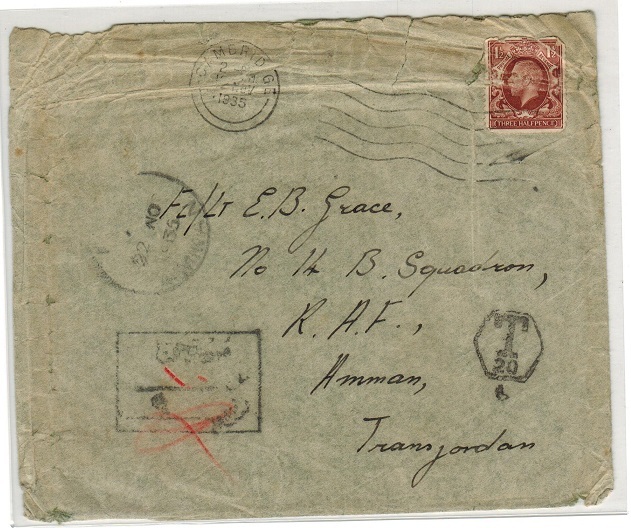 inward cover from the UK addressed to a Fl/Lt Grace at RAF Amman with AMMAN with arrival cds dated 22.NO.35 on front of the cover and being struck by the rare black Arabic instructional handstamp (Proud type I4) with red manuscript mark applied. The cover is somewhat tatty around the edges and with faults but a very elusive marking. TRANSJORDAN - 1936 registered OHMS cover to USA used at AMMAN. 1936 (DE.7.) registered stampless O.H.M.S. 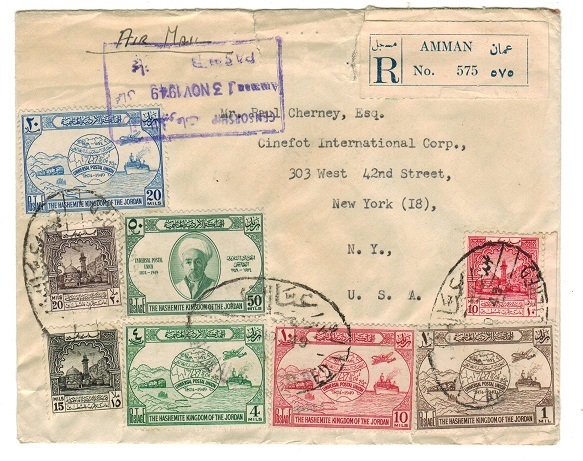 manila pre-printed cover (in Arabic) addressed to USA cancelled by AMMAN REGISTERED oval cancel with JORDAN official departmental cachet at lower left. (Small corner missing and odd fault). 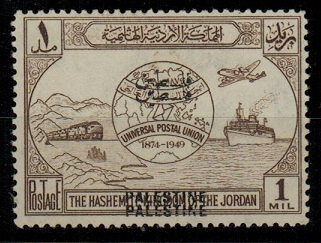 TRANSJORDAN - 1943 censored FORMULA RPSE used locally (ex flap) at AMMAN. 1943 (JY.24.) 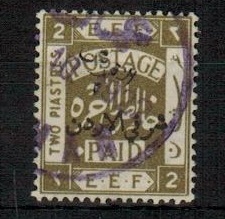 use of black on buff FORMULA registered postal stationery envelope (ex reverse flap)bearing 1m-50m adhesives tied AMMAN and with oval AMMAN REGISTERED strike below with the addition of a clear sexagonal PASSED BY CENSOR/B-42 strike in violet ink. Sent from RAF Amman. 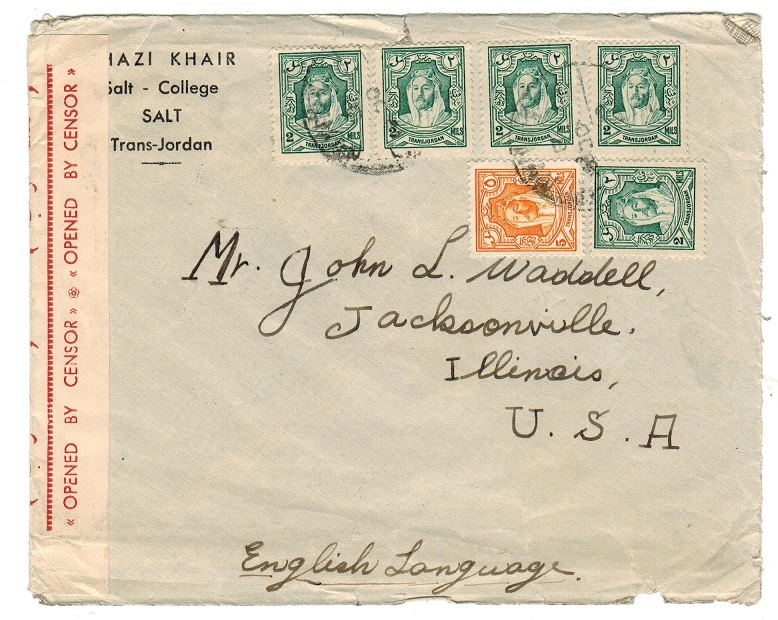 TRANSJORDAN - 1949 registered cover to USA censored due to the 'Arab-Israeli' war. 1949 (12.NOV.) registered cover to USA bearing 10m,15m and 20m adhesives alongwith 1m, 4m (x2) and 10m 'UPU' issues tied by oval AMMAN REGISTERED cancels and with violet boxed CENSORSHIP/AMMAN/PASSED handstamp applied at top. TRANSJORDAN - 1936 use of postcard to UK used at AMMAN. 1936 (31.MR.) 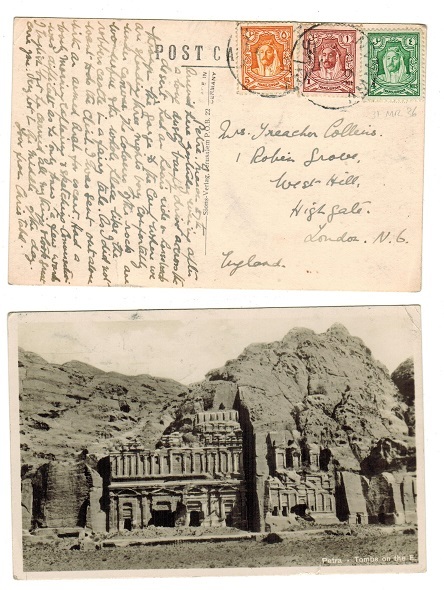 use of picture postcard addressed to UK depicting 'Petra-Tombs of E' bearing 1m,4m and 5m adhesives tied by AMMAN cds's. 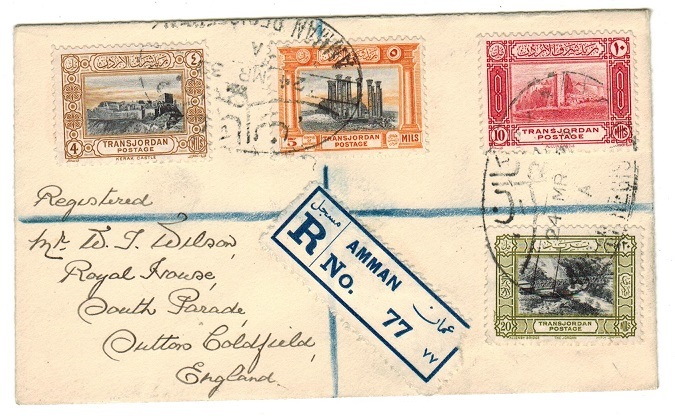 TRANSJORDAN - 1933 registered cover to UK with various 'pictorials' used at AMMAN. 1933 (MR.24.) 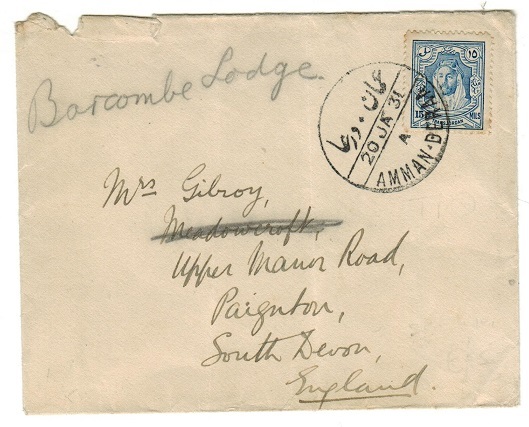 registered cover addressed to UK bearing 4m,5m,10m and 20m adhesives from the 1933 Pictorial series (SG 211-12, 213+215) tied by large oval AMMAN REGISTERED cancels with blue on white perforated R/AMMAN/No. registered label at left. 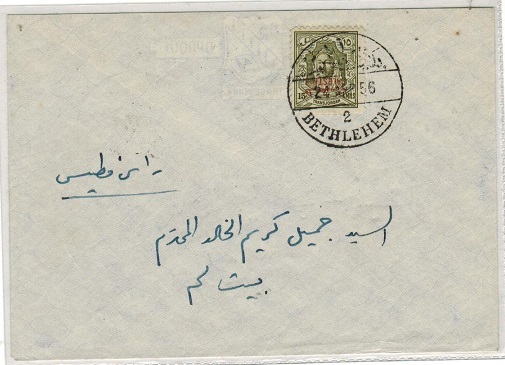 TRANSJORDAN - 1946 'Independence' first day cover used at AMMAN. 1946 (MY.25.) oversized first day cover of the 'Installation Of King Abdullah and Independence' series of 9 (SG 249-57) addressed to Jerusalem and each tied by AMMAN cds's. 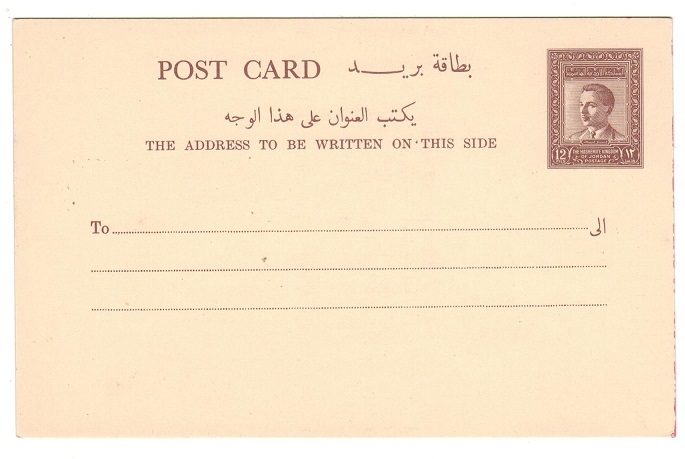 TRANSJORDAN - 1932 unaddressed postcard used at EL ZARQA. 1932 (MR.9.) use of sepia picture postcard (unaddressed and without message) depicting 'View of El Khazneh' and bearing on picture side 2m,3m and 4m adhesives (SG 195,96+98) tied in combination with 1m and 4m 'Postage Dues' (SG D189+191) by scarce EL ZARQA cds's. Similar strikes on reverse. 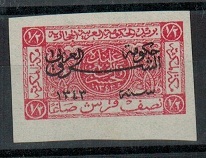 TRANSJORDAN - 1928 5m rate local cover used at SALT. 1928 (JU.21.) cover addressed locally in Arabic (roughly opened at top) bearing 5m adhesive tied by SALT cds (Proud type D3) and with AMMAN arrival b/s. TRANSJORDAN - 1928 5m rate local commercial cover used at AMMAN. 1928 (6.JU.) pre-printed commercial cover addressed locally to Zerka bearing 5m adhesive tied by AMMAN code 'C' cds with superb violet boxed THE EASTERN EXPRESS/AMMAN h/s on reverse with EL ZARQA arrival cds. TRANSJORDAN - 1949 'AV2' cover to Italy with Palestine overprinted adhesives. 1949 (DE.18.) 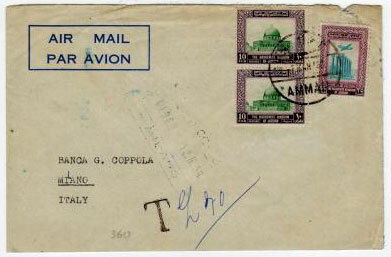 cover addressed to Italy from the Red Cross Office in Amman bearing various Transjordan adhesives overprinted PALESTINE for use during the Occupation and cancelled in Jerusalem with two strikes of the scarce blue boxed 'A.V.2'. handstamp applied below. TRANSJORDAN - 1953 FORMULA air letter pre-stamped with VISIT THE HOLY PLACES overprint. 1953 dark blue on cream FORMULA 'Air Letter' inscribed HASHEMITE KINGDON OF JORDAN with 5f and 20f adhesives applied officially by the Postal service and pre-cancelled before use by violet two lined VISIT THE HOLY PLACES/VISITEZ LES LIEUX SAINTS in violet. TRANSJORDAN - 1940 6m rate cover used at KERAK. 1940 (NO.23.) 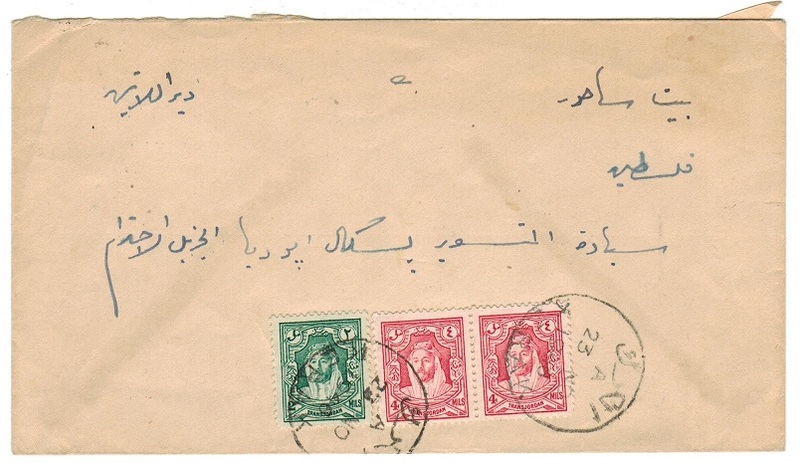 cover addressed to Palestine in Arabic bearing 2m and 4m pair tied by two KERAK cds's. TRANSJORDAN - 1957 FPO/201 cover to UK from Jordan. 1957 (MY.8.) 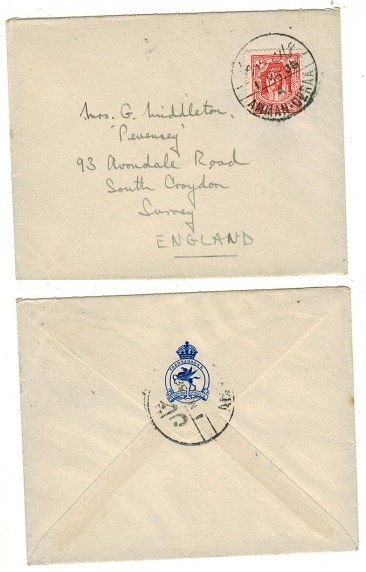 air mail cover to UK bearing 'GB' 2 1/2d adhesive tied by FIELD POST OFFICE/ 201 cds used by troops stationed in Jordan. 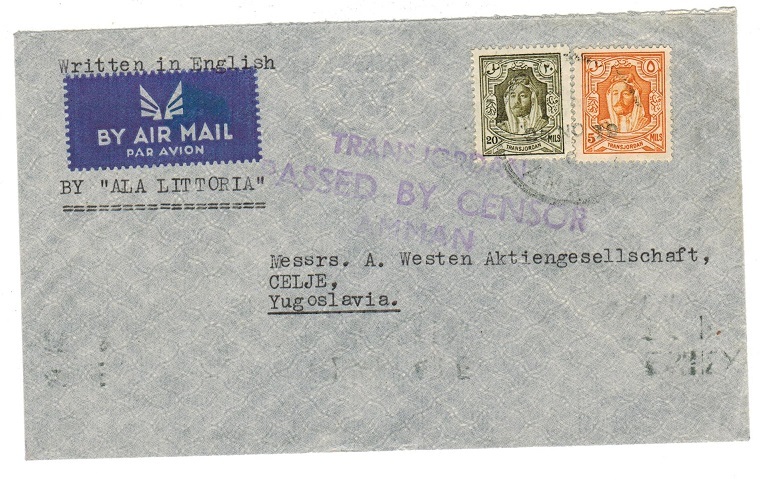 TRANSJORDAN - 1939 'Ala Littoria' flight cover to Yugoslavia with censor mark. 1939 (NO.25.) cover addressed to Yugoslavia bearing 5m and 20m adhesive tied by AMMAN cds with scarce violet three lined TRANSJORDAN/PASSED BY CENSOR/AMMAN handstamp below. TRANSJORDAN - 1945 censor cover to USA. 1945 (AU.29.) 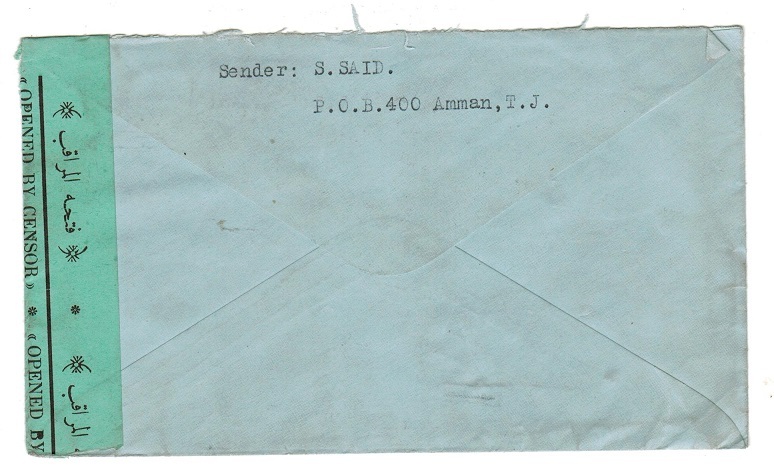 cover addressed to USA bearing 20 mils adhesive tied by AMMAN cds with violet PASSED BY CENSOR/ B - 41 h/s at right. TRANSJORDAN - 1949 Arab-Israeli war censor cover to UK. 1949 (Oct.25.) cover addressed to UK bearing 1m,4m,20m 'king head' adhesives tied with 10m and 20m adhesives by AMMAN cds with violet boxed CENSOR/AMMAN/PASSED strike on reverse used during the Arab-Israeli war. 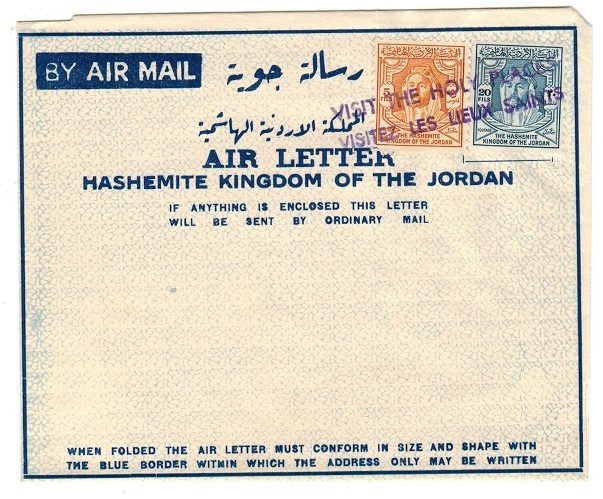 TRANSJORDAN - 1950 use of blue on white FORMULA air letter addressed to UK. 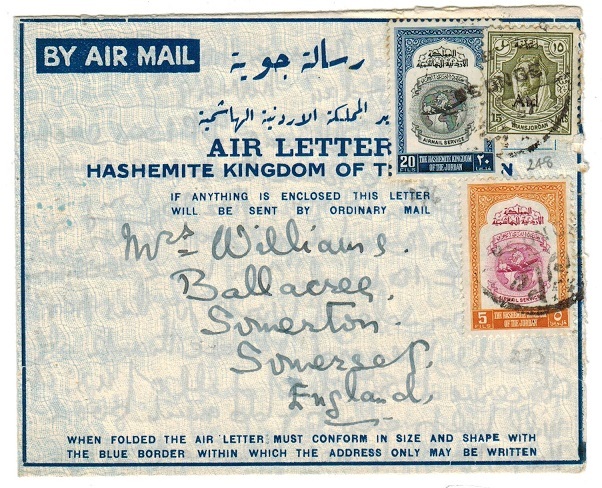 1950 (NO.30) use of FORMULA blue on blue/white overlaid AIR LETTER/HASHEMITE KINGDOM OF TRANSJORDAN air letter addressed to UK & bearing additional 5m, 15m & 20m adhesives tied by bi-lingual AMMAN cds. Sent from the Gileod Mission Hospital & with long contents. TRANSJORDAN - 1953 12fil PSC unused. H&G 1. 1953 12 fils violet-brown on cream postal stationery postcard in fine unused condition. H&G 1. 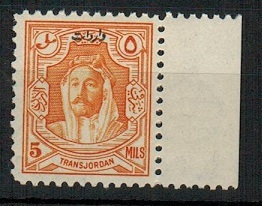 TRANSJORDAN - 1930 5m orange (SG 198) U/M overprinted for REVENUE use. 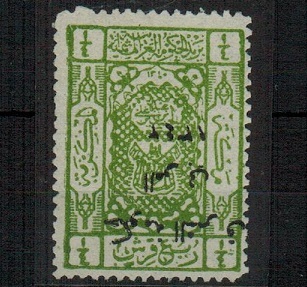 1930 5m orange (SG 198) in a fine unmounted mint marginal example overprinted at top in Arabic for REVENUE use. TRANSJORDAN - 1941 cover addressed to USA with red OPENED BY CENSOR label applied. 1941 (OC.20.) 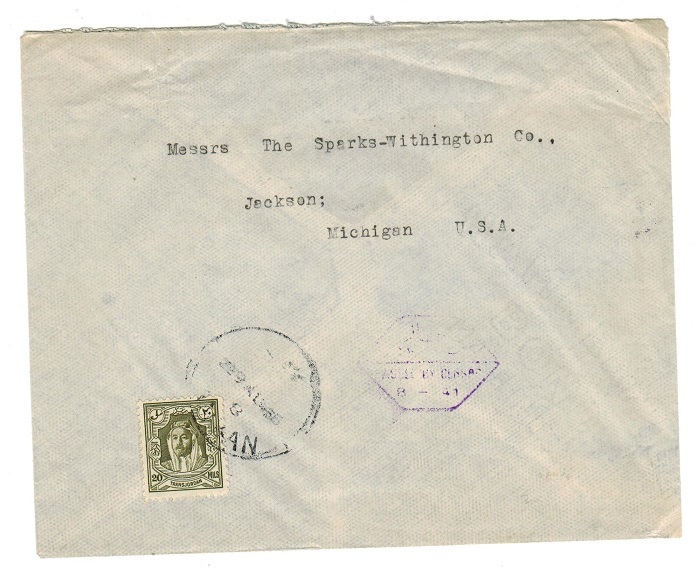 commercial cover addressed to USA bearing 2m (x5) and 5m adhesives tied by AMMAN cds's with scarce red on cream OPENED BY CENSOR strip at left (Little type 3). 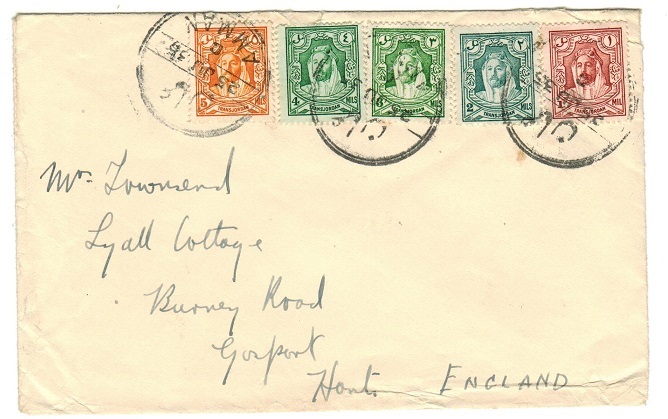 TRANSJORDAN - 1943 cover to UK with green OPENED BY CENSOR label. 1943 (SP.27.) 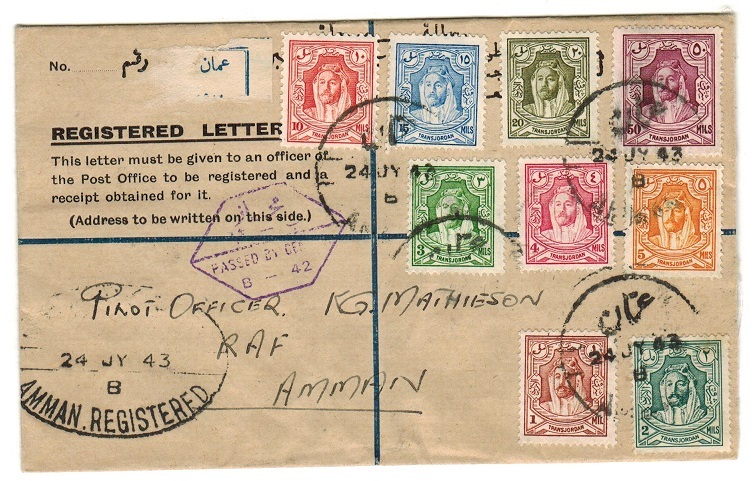 cover addressed to UK bearing 15m and 20m (x2) tied by light AMMAN cds with black on green OPENED BY CENSOR strip at right (Little type 4B2) with violet PASSED BY CENSOR/TRANSJORDAN/3 h/s applied. TRANSJORDAN - 1952 50mils 'Obligatory Tax' adhesive used on cover to UK from AMMAN. 1952 (FE.22) long cover to UK bearing the Obligatory Tax 50 mils reddish violet adhesive tied by AMMAN/5 cds. 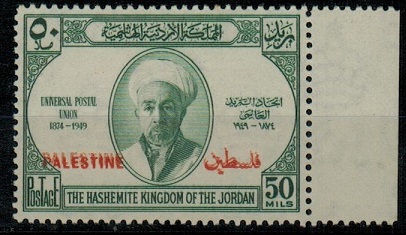 TRANSJORDAN - 1950 HASHIMITE KINGHDOM official cover with ARMY SIGNAL cancels. 1950 (4.XII.) 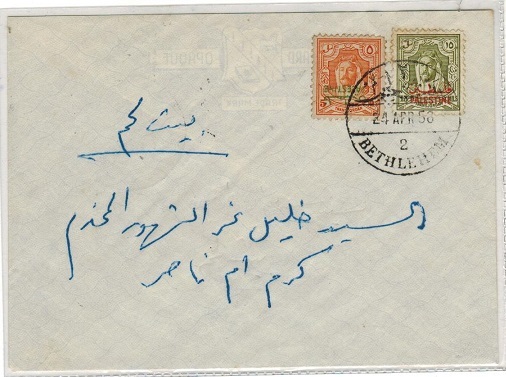 long HASHIMITE KINGDOM OF TRANSJORDAN manilla official envelope addressed in Arabic with violet boxed ARAB LEGION/STORES-AMMAN T.J.handstamp on reverse and boxed 'Arabic' strike on front. Struck by a range of ARMY/SIGNALS cancels showing codes 'ZC', 'R' and 'AX' prefixes. A scarce military use in Transjordan. TRANSJORDAN - 1949 AMMAN PASSED censor cover to UK with FOUND DAMAGE strip at top. 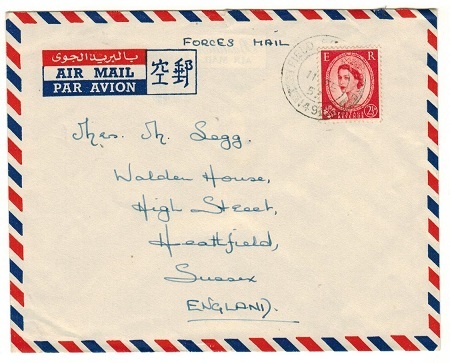 1949 (NOV.7) long envelope addressed to UK bearing 5m pair & 10 mil pair tied by AMMAN cds. Backstamped by violet boxed bi-lingual AMMAN 7 NOV 1949/PASSED h/s. Black on manilla crested G.R./FOUND OPEN OR DAMAGED/AND OFFICIALLY SECURED labels at top tied in Bradford on arrival. Unusual item. TRANSJORDAN - 1947 'Inauguration' set all IMPERFORATE. SG 276-84. 1947 Inauguration of First National Parliament series of nine values all IMPERFORATE. Issued imperforate only as official souvenirs. SG 276-84. TRANSJORDAN - 1927 5m IMPERFORATE DIE PROOF in black brown COMPLETELY REVERSED. 1927 5m 'Emire Abjullah' IMPERFORATE DIE PROOF of the un-adopted frame and design with the seven pointed star printed in black -brown on gummed thick card and showing the printing COMPLETELY REVERSED. Scarce item. TRANSJORDAN - 1953 3f black and carmine mint with DOUBLE BARS. SG 380. 1953 3f black and carmine 'Unification' adhesive in mounted mint condition overprinted by two bars (1 1/2mm apart) and showing the major variety DOUBLE BARS. SG 380. TRANSJORDAN - 1953 20f U/M with DOUBLE BARS. SG 384. 1953 20f black and deep blue 'Unification' adhesive in am unmounted mint example overprinted by two bars (1 1/2mm apart) and showing the major variety DOUBLE BARS. SG 384. TRANSJORDAN - 1925 5p chestnut adhesive in mint condition with IMPERFORATE variety. SG 142. 1925 5p chestnut in a fine IMPERFORATE mint example. SG142. TRANSJORDAN - 1925 1/2p carmine in mint condition with IMPERFORATE variety. SG 137. 1925 1/2p carmine in a fine IMPERFORATE mint example. SG137. TRANSJORDAN - 1925 1/4p adhesive in fine mint condition with IMPERFORATE variety. SG 136. 1925 1/4p ultramarine in a fine IMPERFORATE mint example. SG136. TRANSJORDAN - 1901 5pi Turkey adhesive used at SALT. SG 172. 1901 5pi mauve adhesive of Turkey (SG 172) cancelled by part SALT cds dated 23.3.1908. 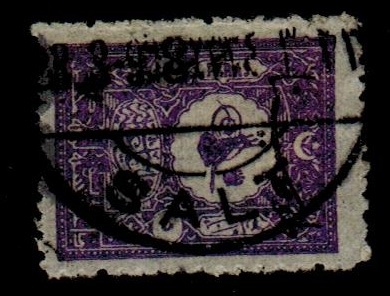 Turkish stamps used in Jordan are very rare indeed. TRANSJORDAN - 1958 under paid cover to Italy with tax mark. 1958 (MAR.7.) 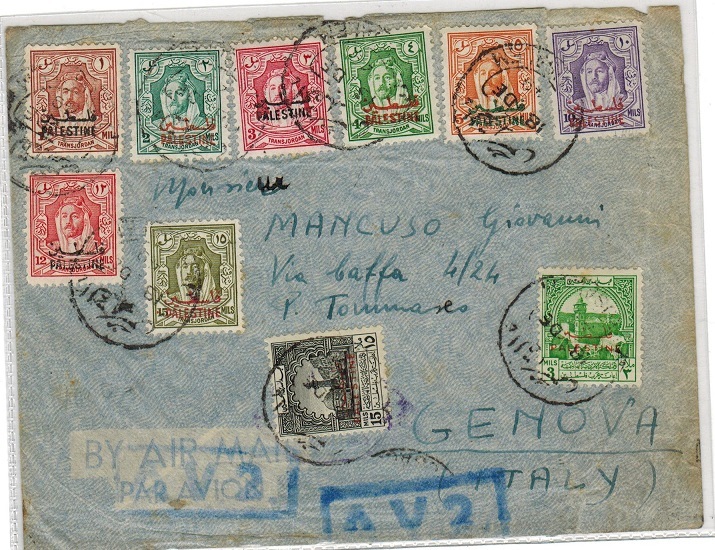 cover addressed to Italy bearing 10f pair and 35f adhesives tied by AMMAN cds and being under paid having scarce 'T' tax mark applied in black. Bluish 'T' tax h/s applied on arrival on reverse with additional 70l charge and SERVIZIO TASSATE/MILANO A-D. cds. 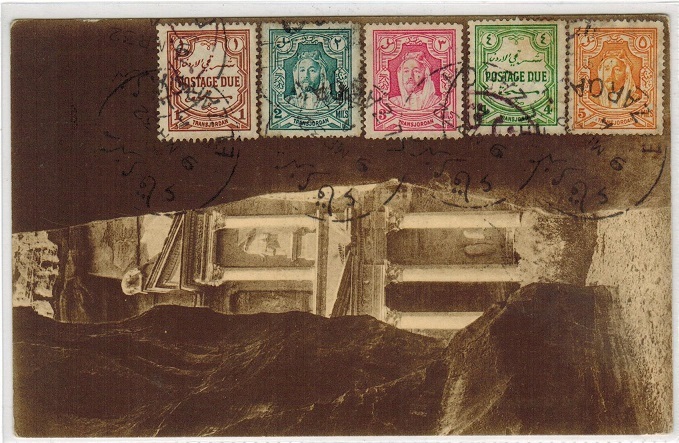 TRANSJORDAN - 1928 5m local cover from AMMAN. 1928 (AP.23.) 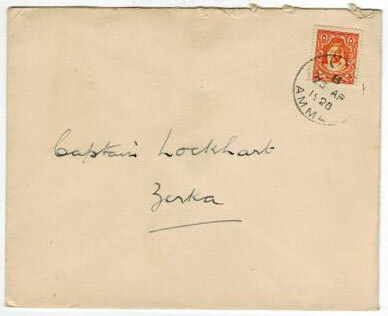 cover addressed to Zerka bearing 5m adhesive tied by AMMAN code 'B' cds and with EL ZARQA arrival b/s. 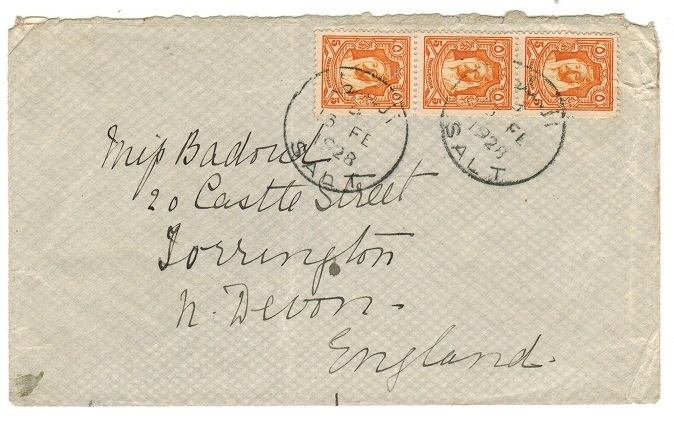 TRANSJORDAN - 1921 1p rated cover to UK from SALT. 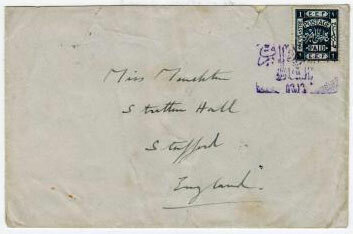 1921 cover addressed to UK bearing 1p (silver overprint) adhesive (SG 14) tied by scarce 'Arab Kingdom' three lined SALT cancellator struck in 'violet' ink. JERUSAL M transit b/s (spaced lettering) dated 2.MR.21. A very scarce genuine use of this stamp on cover.